While on our first visit to Manhattan, a lot of our planning revolved around various restaurants we wanted to visit and foods we wanted to try. We hit so many restaurants and food hotspots that I decided to split this into two posts. Don’t forget to check out Eating New York Part 2. There are certain foods that are a must if you go to New York. First on the list: Pizza. 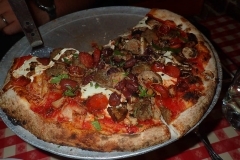 Lombardi’s kept coming up: As “America’s first pizzeria” established in 1905, I figured this had to be good pizza. I guess I’m a deep dish fan. However, their pizza was just okay. It was definitely not worth the prices. Even if the prices were better, it wasn’t worth the poor service. When you are spending $35+ on a small pizza, you expect to eat off of something other than disposable plates. When you ask for water, glassware would be nice instead of plastic cups. And you have to ask for ice. I know in Europe its common to serve water at room temperature but this isn’t Europe. Keep in mind this place doesn’t take cards. Bring cash or visit the ATM. This is a theme that seems very prevalent in New York, which I find ironic. There is a major push to go to a cashless society; New York is the financial center of the United States and we visited several places that were cash only. I bet the books are interesting at the end of the night. In the end this place felt like a tourist trap. I don’t think I would eat here again but instead would be looking for the pizza that the locals eat. After Lombardi’s, we decided to walk off the calories while sightseeing. We headed over to Murray’s Cheese. I think I have found a new challenge in life. I did not realize there were that many cheeses in the world. Thankfully we talked each other out of picking up a sample pack. However, we couldn’t pass up dessert. We actually found this place by pure luck. We came across it while searching Google maps for places to go in the East Village. It’s called the Big Gay Ice Cream Shop. The place was extreme in so many ways. 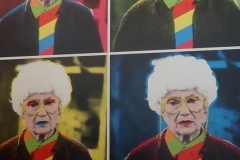 From toppings that include Olive Oil and Sea Salt, Wasabe Pea Dust, Elderflower Syrup, and Cayenne Pepper to the fact that they have an Andy Warhol of Estelle Getty. I ordered the Salty Pimp because I’m a sucker for dulce de leche and Lisa ordered a mashup of the Salty Pimp and American Globs. And they let you line the waffle cone in Nutella. I don’t remember much for the hour or so after that. The sugar rush ended as we were on our way back to our hotel. That evening we checked off another tourist stop. Katz located in the East Village at 205 E. Houston. For those of you who are first timers to Katz, let me help you out a little so you don’t look like the complete noob. When you walk in they hand each person in your party a ticket. That ticket is important. The carvers write what you get on it so that when you leave you can be charged accordingly. Even if you put everything on one ticket, DON’T LOSE THE OTHER TICKETS. If you don’t turn in your unused tickets you have to pay the maximum. It’s kind of like a parking garage. If you lose your ticket, you pay the maximum rate. In this case, it’s $50. Some would look at that as a challenge for all-you-can-eat pastrami. We stepped up to the carvers. 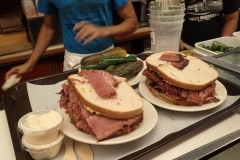 I’m typically a corned beef kind of person but everyone says to get the pastrami. So we got one of each. I have to go with the pastrami crowd. It was nice and juicy with just the right amount of fat on it. It was delicious. In addition, we saw the location of the famous scene from “When Harry Met Sally.” Some people told us we needed to compare it to Carnegie Deli. Unfortunately, we didn’t make it down there and I recently read that Carnegie Deli will be closing at the end of the year so it looks like I won’t be able to. Rumor has it that they will keep the licensed location in Vegas open so I may end up getting to try it there one day but it won’t be the same. I think the only thing that kept us from suffering major heart problems was the fact that we did plenty of walking over this trip. The dietary intake sure didn’t contribute to overall good health. The next item on the New York gotta-try list was bagels. This time reviews and articles and research did not lead us astray. We checked out Absolute Bagels at 2788 Broadway, south of Columbia University. It takes a lot to get college students up early. When there is a line of people stretching out the door and down the block at 7 a.m., you can make a safe bet that you have a winner. This is an absolutely no-frills bagel place. I thought the ones in D.C. were a bit hole in the wall. This one was a bagel bakery with a quick retail section thrown up in the front. The bagels were fresh and flavorful. I had the everything bagel with sun dried tomato cream cheese. 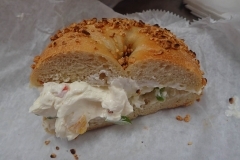 Lisa had the garlic bagel with pimento cream cheese. Our final stop for Part 1 is cheesecake. But not just any cheesecake. This cheesecake ruined other cheesecakes for me. 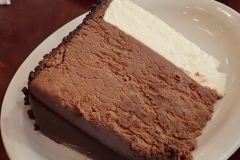 Junior’s Cheesecake, located near Times Square. After walking through Central Park (which is huge by the way) for a few hours, we stopped in for “lunch.” It only qualified for that term because of the fact that it was around the usual time one would have such a meal. Ours consisted of 3 slices of cheesecake between 2 people. Each of these slices could have been cut in half and I would have been none the wiser. They were massive! Unfortunately, we only got a picture of one because, well, I couldn’t control myself while Lisa got the camera out. Chocolate Mousse Cheesecake and in the background there is carrot cake cheesecake. Not pictured was Junior’s plain cheesecake. I have to make sure I eat my vegetables now. Check our Part 2 of Eating New York.